[S556] Bob Juch, online www.juch.org/gedpage/fam/fam01103.asp. Anecdote* 1638� In 1638 at Nansemond, VA, We have no clue how Keziah acquired her distinctively non-Indian name except that the name Elizabeth was taken at her baptism, a not unusual occurrence at the time. Part of the Nansemond tribe were quick to embrace Christianity and English ways. By the year 1650, the Nansemonds had split into "Christian" Nansemonds and "Reservation" Nansemonds. The Christian Nansemonds survived. In the year 1746, the Reservation Nansemonds had dwindled to the point that they sold their reservation and merged with the Nottaway tribe. The last known Reservation Nansemond died in 1806. The Christian Nansemonds survive to this day, and many live in the Bowers Hill Community near Norfolk. The tribe has revived in recent years, and the current Chief is Barry "Big Buck" Bass while the Assistant Chief is Earl Bass, so the Bass name continues. There also is possible evidence of another Indian ancestor, Love Harris of North Carolina. A fascinating, but most unlikely possibility is that Keziah was a given name and that her mother was one of the "Lost Colonists" of the Raleigh expedition. David Beers Quinn in" The Lost Colonists-Their Fortune And Probable Fate," published by the North Carolina Department of Archives and History, presents evidence showing that the lost colonists survived with the Chesapeake Indians on the south shore of the Chesapeake Bay in the present Princess Anne County, but that both the Chesapeake Indians and the remnant colonists were wiped out by Powhatan just before the landing of the new colony at Jamestown. The Chesapeake Indians and the Nansemond Indians (who resided just west of the Chesapeakes near the present city of Norfolk) were, at one time, allies against the growing power of the ruler, Powhatan. It was reported by the Jamestown colonists in 1622, that they had seen "a savage boy about the age of ten years which had a head of hair of perfect yellow and a reasonably white skin." Sadly, the roster of the colonists at Roanoke Island shows no surname Tucker, or Christian name Keziah. Certainly the Nansemond Indians were at the right place, at the right time, and perhaps, with the appropriate political and ethical state of mind, to be motivated to rescue an English child from the depredations of their former ruler, Powhatan. John Basse simply states that he, "John Basse marrid Keziah Elizabeth Tucker dafter of Robin the Elder of ye Nansimums kingdom, a Baptized Xtian, in Holy Matrimonie accdg. to ye Canons of ye Church of England, ye 14th day of August in the Yeare of our Blessed Lord 1638". Elsewhere: "John Basse married ye dafter of ye King of ye Nansemond Nation, by Elizabeth in Holy Baptism and in Holy Matrimonie ye 14 day of August in ye yeare of Our Blessed Lord 1638." Keziah died Dec 4, 1676 and John Basse died April 2, 1699. [Taylor, all]. [S459] Lea L. & Silvestri, Patti L. Dowd, Early Basses in Virginia. [S634] Barb Clayton, "usgwarchives", Ancestral File, Documented completely in "Book of John Basse of Norfolk Virginia housed in North Carolina State Archives. The name Tucker is based on daughter's name not on finding Robin and Tucker together. Robin is simply called Robin the elder of the Nansemond Kingdom. Death 23 July 1789� He died on 23 July 1789 at Thiais, France, at age 70 J’ai bien reçu vos deux messages. Je vous souhaite tout d’abord une très bonne année 2012. Je vous avais écrit il y a plusieurs années et je n’avais pas reçu de réponse. Je suis bien entendu très intéressée par les documents que vous avez en votre possession concernant la famille VALCOURT. Je fais de la généalogie depuis plus de 20 ans. Maman, à qui j’avais demandé d’écrire ses mémoires, m’avait parlé toujours d’Alexandre de Valcourt, comme un aïeul. Ma première démarche a été d’aller aux Archives Nationales et de retrouver la trace de la famille VALCOURT. Le document que j’y ai trouvé, et ce fut un choc, est un acte (j’en ai la photocopie) sur lequel il est écrit qu’Alexandre donnait une très grosse somme à une fille qu’il a eue avec Barbe Marguerite MECHLING, du nom d’ Alexandrine Marie Joséphine née le 13.3.1789 à Paris. Barbe et Alexandre ne sont pas mariés, pourtant le père de Barbe est Philippe MECHLING, bourgeois de Paris, ce qui représentait quelque chose. Ce dernier a été nommé tuteur de sa petite-fille Alexandrine. 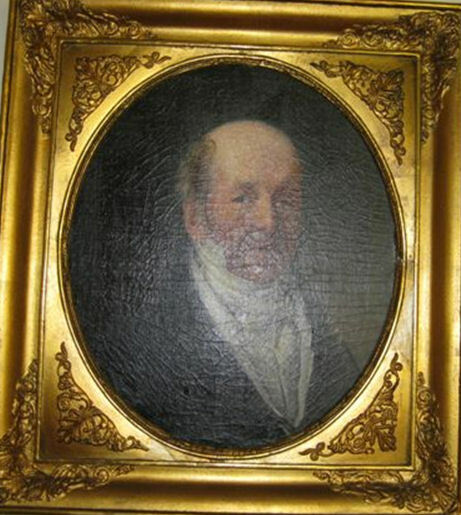 Le petit-fils de cette dernière, François a été avoué et en 1836 est parti en Algérie. La fille de ce dernier Louise a épousé mon arrière grand-père Achille Huré, avocat, bâtonnier, conseiller à la Cour d’Appel d’Alger. Sa petite-fille Jacqueline, ma mère, a vécu à Alger jusqu’à son mariage. Elle s’est mariée à Pierre Brusaut, colonel de cavalerie. Voilà en peu de mots l’histoire entre Alexandre de Valcourt et moi. Une de mes cousines germaines la comtesse… dans son château en Alsace possède un très beau coffre de voyage ayant appartenu à Alexandre de Valcourt. J’ai beaucoup étudié la famille VALCOURT. Je comprends qu’ils aient changé leur nom. GALLOPIN n’est pas très beau en français. J’ai des éléments que vous n’avez pas. En particulier, le père d’Alexandre de Valcourt, Jean Baptiste Bernard est décédé le 23 juillet 1789 à THIAIS (localité près de Paris) où il possédait une maison de 4 hectares et 21 ares, juste quelques jours après la prise de la Bastille. Je voulais vous dire que la maison de la rue Montmartre où habitaient les Valcourt n’existe plus, elle a fait partie des milliers de maisons qui ont été rasés par le baron Haussmann à la fin du 19ème siècle pour faire de Paris une ville plus aérée et plus moderne. Note* � He In 1978 there was a letter from an Alexandre Joseph DeValcourt, G. H. G. Norman, to another cousin in which, among other things, he pointed out that the most of the de Valcourt papers, including the original patent of nobility and gone from François Alexandre to son, Alexandre Joseph, then to his son Edouard (1860-1947), then to Edouard's eldest daughter, Simone (1896-1986), wife of Georges Jouasset. And from Simone, the documents went to her son, Daniel Jouasset (1918 - ), who in 1978 was living 16 Chemin de Prunay, 78340 Louveciennes, France, but in poor health. Since in 2006 it is unlikely he is still alive, the papers probably went to daughter Muriel Jouasset (1950- ) who married Jean-Jaques Schulberger in about 1970. I once saw, at a DeValcourt reunion in the nineties, what was purported to be a copy of the original patent of nobility but the holder was reluctant to have a copy made. For someone who is interested in having a copy of the original, it would be worthwhile to try and contact the Jouassets or Schulbergers in France. In case you don't already have it, attached is a copy of the marriage record of our common ancestors --- François Alexandre and Margaret Gold DeValcourt. Have copies of the orignal entries in the baptism register of St. Peter's for all their children save Caroline, born 4 May 1801 in Paris. Her baptism record may be in the archives for St. Eustache Parish there. Name Variation 1746� As of 1746, Sieur Jean Baptiste Bernard de Valcourt was also known as Jean Baptiste Bernard Galopin Paris Archives Reference 01 901532: Letters allowing Jean Baptiste Bernard Galopin to change his hame to Jean Baptiste Bernard de Valcourt. March 1746. NOBILITY* November 1770� He wasconfirmed to nobility Paris Archives Reference 01 11611163: At Versailles in November of 1770, Nobleness was given by Louis XV to Jean Baptiste Bernard de Valcourt and to all his descendants. Apparently, it took a number of years for the paper work to get processed. 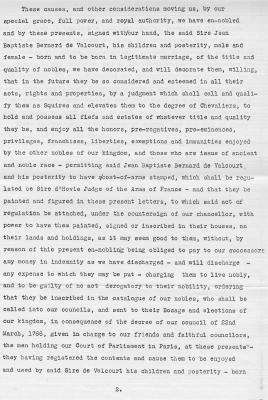 By letter dated November 1770, 57th year of Louis XV’s reign, the King grants nobility to Jean Baptiste Bernard de Valcourt.. These patent letters, signed by Louis XV in 1770, show registration by the “Chambre des Comptes” on May 20th 1772 and by the “Cour des Aides” on Feb. 26th .... 1777! In the meantime, we find two receipt dated April 14th 1772 and May 9th1772, for 2.000 and 6.000 “livres” (pounds of the time) expressly referring to the above patent letters. What is the reason for the new patent letters, identical to those of 1770, signed Louis XV and dated August 1772? Probably by the fact things had remained pending since the registration of the “Chambre des Comptes” in May 1772. 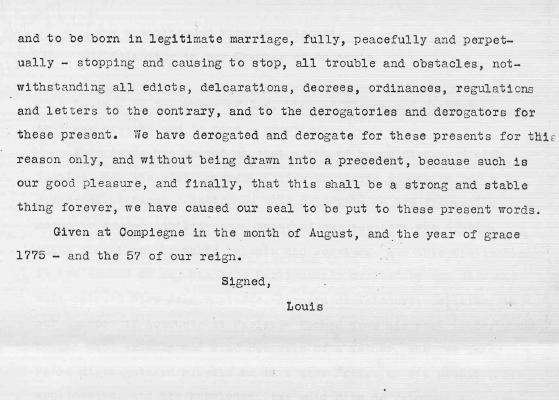 These did not have ... effect either, since there is a letter dated March 3rd 1775, signed Louis XVI, on desiring the Parliament to register them. On March 21st, 1775, this registration is requested from the members of the Parliament by a letter of Jean Baptiste Bernard de Valcourt. The patent letter of March 3rd 1775 is handed over at the same date to the “Prosecutor General of the King”, who orders an inquest on the applicant. Witnesses designated for this inquest give a favorable advice on April 1st 1775. Two documents, not dated but coming after this inquest again request registration of the patent letters of 1772 --- yet another letter, dated March 27th 1776 and signed by Louis XVI firmly orders to the “Cour des Aides” to proceed with registration. Is that the end of it? Not yet! Another letter of Louis XVI, dated 10th (or 6th) of January 1777 orders again to the “Cour des Aides” to register the patent letters of ...1770… And here it goes:... Feb, 21st 1777 and leads to the registration by the “Cour des Aides” on Feb 26th on the patent letters of 1770. The original order was issued by Louis XV and it was his successor Louis XVI who finalized the order seven years later. "For good conduct, intelligence, sense of justice and activity." 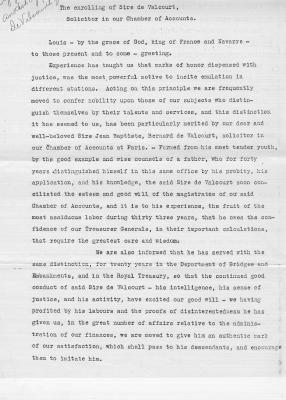 as a solicitor in the Royal Treasury during thirty-three years of service. Paris Archives Reference 01 11611163: At Versailles in November of 1770, Nobleness was given by Louis XV to Jean Baptiste Bernard de Valcourt and to all his descendants. Paris Archives Reference DC 1618: By a letter from the Grande Chancellerie written in Compiegne in August 17721 and signed LOUIS, it appears that his Majesty has given nobleness to Jean Baptiste Bernard de Valcourt, Procureur ien la Chambre des Comptes. Paris Archives Reference 01 901532: Letters allowing Jean Baptiste Bernard Galopin to change his hame to Jean Baptiste Bernard de Valcourt. 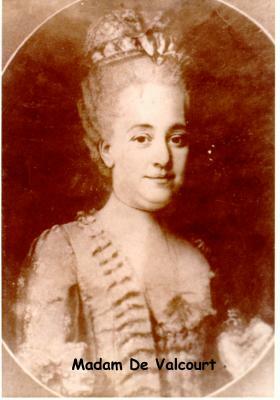 March 1746. By patent letters dated November 1770, Louis XV grants nobility to Jean Baptiste Bernard de Valcourt, these letters are registered in the Chamber of Accounts on 20 May 1772; two receipts are found dated 6 April and 9 May, 1772, for 2000 and 6000 "livres" respectively and expressly refer to the patent letters of 1770. A new patent letter, identical to the one of 1770, is signed by Louis XV and dated August 1772. Registry is ordered from the Parliament by Louis XVI patent letter of 3 March 1775; Jean Baptiste Bernard de Valcourt requests this registration from the members of Parliament in a letter dated 21 March 1775. The Prosecuter General of the King receives the letter of 21 March 1775 and orders an inquest with witnesses giving favorable advice on 1 April 1775. Two undated documents coming after the inquest again requests registration of the patent letters of 1772. Another letter dated 27 March 1776 and signed by Louis XVI orders the Cour des Aides to proceed with registration and still another letter of Louis XVI, dated January of 1777, orders the Cour des Aides to register the patent letters of 1770. The Cour des Aides registers the patent letters of 1770 on 26 February 1777. Paris Archives Reference DC 1618: By a letter from the Grande Chancellerie written in Compiegne in August 17721 and signed LOUIS, it appears that his Majesty has given nobleness to Jean Baptiste Bernard de Valcourt, Procureur en la Chambre des Comptes. "The original was in the possession of Mrs. R. W. Carroll (Aunt Belle) great granddaughter and sister of Edward Courtney Piatt who was the father of Jane Stamps deValcourt Piatt and J. W. Piatt." Evidentally his family name was Galopin and he petioned the king for a name change about the time he was granted nobility. My guess is that the name means something like "of the good heart" and was an honorific. [S576] Vic Jeter, "Vic," e-mail to MVW, January 2006.